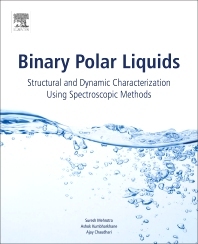 Binary Polar Liquids: Structural and Dynamic Characterization Using Spectroscopic Methods provides liquid state physical chemists and physicists with practical theoretical models based on a wealth of robust data that describe the dielectric properties of dipolar materials in a systematic manner. In many applications, reference measurements using dielectric permittivity data are required. Over the past three decades, the author has compiled and analyzed permittivity research data and relaxation times for various polar liquids and their mixtures. The resulting structural data - as determined from various models - is critically evaluated, arming scientists with a complete characterization of the spectra of water-containing mixtures. Dr. Suresh Chandra Mehrotra has completed M. Sc. Physics (1970), Ph.D. (1975), Post Doctorate (Welch Foundation Fellow) (1974-75). Now his designation as Srinivasa Ramanujan Geospatial Chair Professor. He is recipient of Career Award, FOM, Alexander Von Humboldt Fellowship, F.N.A.Sc. He is a fellow and life member of Indian Physics Association (IPA), Indian Laser Association (ILA), Indian Science Congress Association, and IETE. He has also been awarded with Best Teacher Award from Maharashtra (MS) state. More than 239 research papers are published in reputed journals and conferences, and 5 books to his credit. He has organized 7 conferences/workshop and seminar as Chairman/Convener. He has successfully completed Eight Research Project. His fields of specializations are Microwaves Interaction with Matter, Time Domain Spectroscopy Pattern Recognition, Brain Computer Interfacing, Medical Instrumentation, Human Computer Interface, Speech Processing, Signal Processing, Remote sensing and GIS, Hyper Spectral Image Processing. Prof. Ajay Chaurdhary is a professor of physics at the Institute of Science in Mumbai. His research areas include hydrogen storage, nonlinear optical properties, micro-solvation effect of biomolecules and organic solvents, interstellar molecules, spectroscopic characterization of molecules, hydrogen bonding, Monte Carlo Simulation, and dielectric relaxation.